Four Ford School undergraduate students were nominated for Dr. Martin Luther King Jr. Spirit Awards this year for exemplifying leadership and extraordinary vision in inclusivity and social justice. Kyra Hudson (BA '19), Gloriela Iguina-Colón (BA '18), Yvonne Navarrete (BA '19), and Rhea Ninan (BA '18) were nominated for the award with awards going to Navarrete and Iguina-Colón. Ford School students have a history of being Spirit Award recipients for their dedication to diversity, equity, and inclusion. 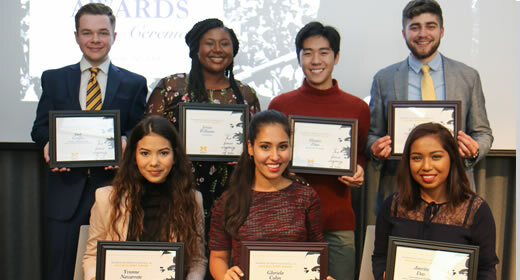 The Spirit Awards honor undergraduate students at U-M's Ann Arbor campus who are nominated by a faculty or staff member. Nominees must write an essay describing their work to foster equity, inclusivity, and social justice and awards are given to students who challenge oppressive norms, promote cross-cultural collaboration, confront systemic injustices, and build inclusive communities and equitable spaces. Navarrete was born in Mexico and raised in Southwest Detroit. She has been deeply involved in community organizing on policy issues regarding the Latinx community and is currently the lead director of La Casa, the central Latinx student organization on campus. As a DACA recipient and advocate for immigrant rights, she continues to empower and center the voices of those often placed in the margins. Iguina-Colón is a senior majoring in public policy with a minor in environmental science. She is the chair of the undergraduate chapter of the the Ford School's Students of Color in Public Policy group, was a Marsh Fellow with the Global Intercultural Experiences for Undergraduates (GIEU) program, and served as program assistant with the Program on Intergroup Relations.